Info: Design, Anna Labbee, , Seattle (206/547-6242). Resources: Misty Morn paint (item C2-234 P) by . Martinique 3- by 6-inch tile in Biscuit from . Bancroft faucet in chrome and porcelain and Caxton undermount sinks from . Aquamarine candle by Nina Campbell ($49) and square marble charger ($45) from . White canister (as vase) from (800/762-1005). 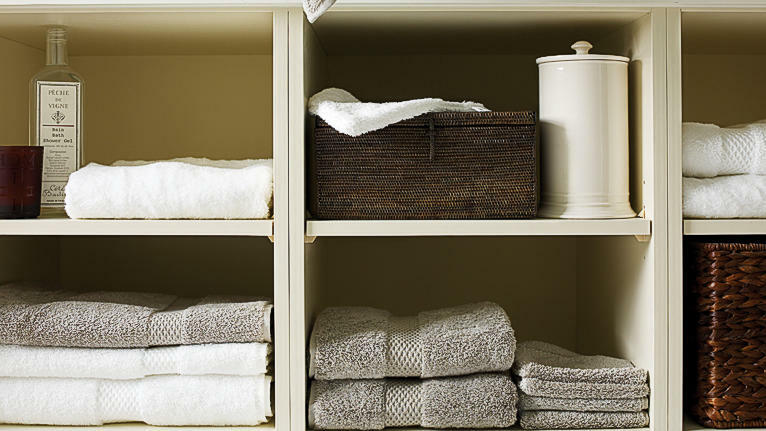 Guest soaps ($3) and Etoile towels ($10-$96) from (800/322-3911). Amber-scented Homer candle from Great Jones Home ($49; see above). Côté Bastide Pêche de Vigne bath and shower gel from ($44). Tava paper holder (brown woven basket) from ($36). White canister from Restoration Hardware (see above).